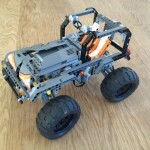 Crocodile | Christoph Bartneck, Ph.D.
Crocodile is a robust off road LEGO car that has four wheel drive and four wheel steering. 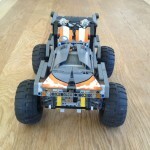 It’s frame is very compact and rigid. It drives fast over obstacles and its independent suspension system makes sure that all wheels touch the ground at all times. 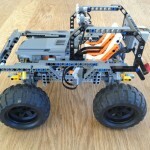 I also spread some of my “wisdom” on how to build a well designed LEGO off road car. me (and my boy) admired your “crocodile” very much. Nice, capable and it doesn’t look to complicated. But still, for us, it would be hard to reproduce it. Do you have some instructions for it? Hope I do not ask too much. I was trying to make some building instructions in LDD, but the essential parts for the steering are still not in their database of bricks. So I am afraid that I cannot offer anything better than the movies right now.